Oval DIRT Dirt Late Model Billy Moyer wins in Australia at the Perth Motorplex! 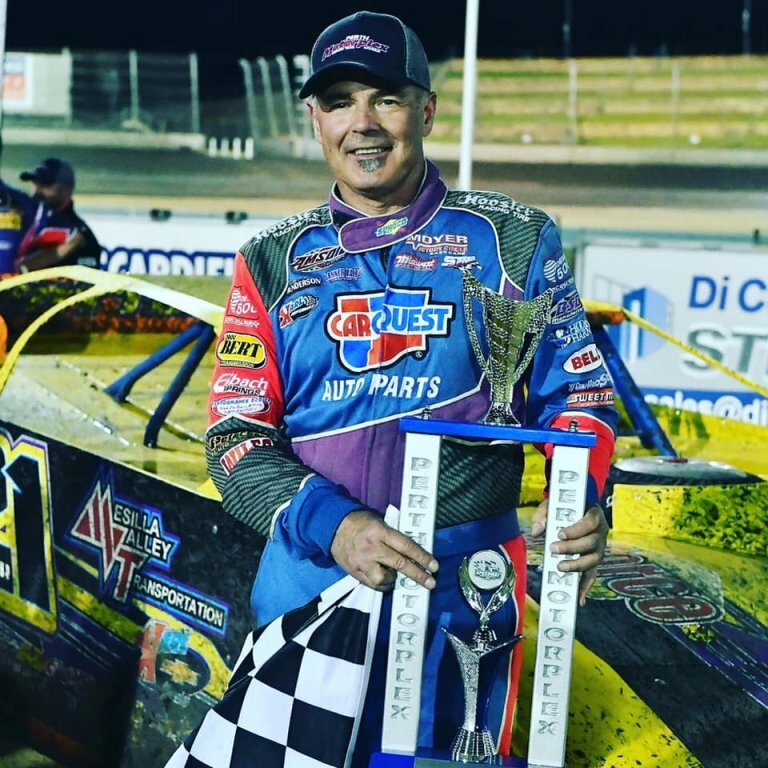 (BATESVILLE, ARKANSAS) Dirt Late Model Hall of Famer Billy Moyer kicked off his 2019 racing season and the USA Invasion Tour in winning fashion last Wednesday, January 9 at Perth Motorplex in Kwinana Beach, Western Australia! In preliminary action at the pristine oval Down Under, Billy stopped the clock second fastest overall during the qualifying session before taking the victory in his first heat race of the evening. After starting from the tail in his second prelim, Billy moved up through the field to nab a fourth place finish. By virtue of racking up the third most points during qualifying and heat race action, the popular driver known as “Mr. Smooth” rolled off from the inside of the second row for the start of the 30-lap main event. Billy then put on a show to dominate his first-ever feature start in Australia to pick up his 836th career win over Joe Godsey, Michael Holmes, Ryan Halliday, and Tyler Erb! On Saturday evening, January 12, the second leg of the USA Invasion Tour of Western Australia took place in the ‘Di Candilo Steel City Late Model Nationals’ – once again at Perth Motorplex. Billy won his first heat race of the night prior to passing five competitors in his second prelim to finish a solid third. The Batesville, Arkansas superstar then started from the outside of the front row in the 40-lap feature event and led the first few circuits. At the unfurling of the checkered flag, Billy found himself in the second position to trail only victor and fellow American Tyler Erb. “It has been a great time in Australia so far and it’s definitely been an experience of a lifetime,” quoted Moyer following the completion of the ‘Late Model Nationals’ at Perth. Round three of the USA Invasion Tour will take center stage this Friday, January 18 at Make Smoking History Collie Speedway in Collie, Western Australia. Following a short overnight drive, things will wrap up with the fourth and final round of competition on Saturday, January 19 at Make Smoking History Bunbury Speedway in Bunbury, Western Australia. More information on these races can be found online at www.colliespeedway.com.au, Bunbury Speedway Facebook page, and the Late Model Racing Western Australia Facebook page. At the conclusion of the USA Invasion Tour on Saturday, there will be an opportunity for two lucky race fans to receive a piece of history – one being a signed rear quarter panel and the other being a signed door panel right off the #21 car. These two prizes will be auctioned off in separate auctions on the Late Model Racing Western Australia (LMRWA) Facebook page with the highest bidders upon closing (Saturday, January 19 at 9:00pm WA time) winning the signed panels. If the lucky winners are in the crowd at Bunbury Speedway, they will be given their signed panels directly off the car, but if not, the signed panels will be mailed direct to anywhere in the world! The direct link to these auctions is https://www.facebook.com/LateModelRacingAustralia/. The Stubber’s have committed the proceeds for the door and quarter panels to the Junior Development Program to encourage the Junior Sedan drivers in Western Australia to transition to Late Models at the age of 16 when they are no longer allowed to be classified as a Junior. In addition, Palice Property Group will match those funds dollar-for-dollar and donate that money to Homestead for Youth (www.homesteadforyouth.org). Homestead for Youth is a non-profit organization committed to empowering young people at risk (and their families) by providing residential services, mentoring, counselling, holistic and innovative therapies, and psychology care in the homely setting of a Meelon, Western Australia farm. 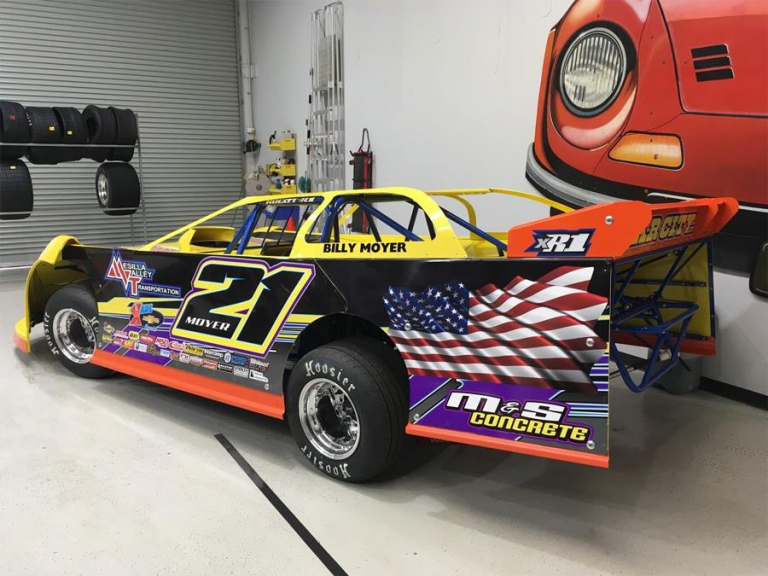 “The Junior Development Program is an integral part of Late Model racing in Western Australia,” exclaimed car owner and fellow driver Paul Stubber. 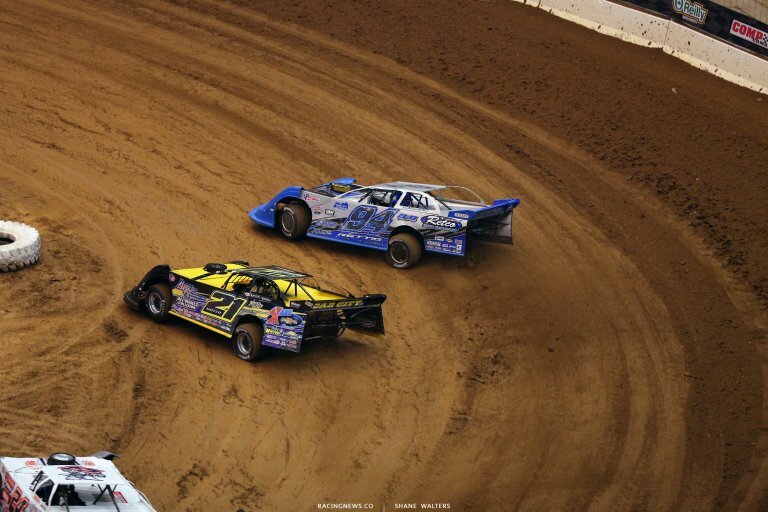 The latest dirt on Billy Moyer Racing (BMR) can be found all year long by clicking on www.BillyMoyer.com.